Miss Vivien’s unique Intimacy Regime will prepare, stimulate and soothe your body to maximise sensual and emotional pleasure; before, during and after your passionate encounters. 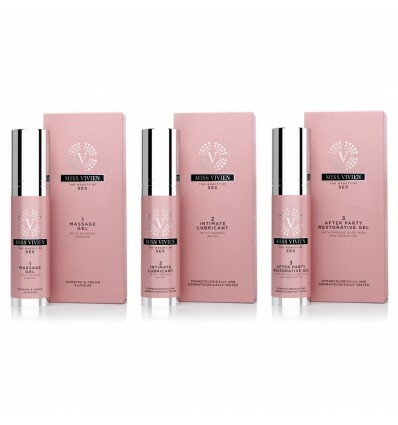 Begin your sensual experience with Step 1 of the Miss Vivien Intimacy Regime; Massage Gel with Diamond Powder. A silky and velvety gel to enhance sensual massage with a delicious cookies and cream flavour. Follow with Step 2 Intimate Lubricant with Thermal Water. A water based gel with a tempting and sensual vanilla flavour. Gently Lubricates to increase comfort and pleasure sexual moments. 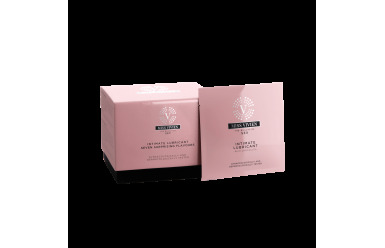 After your passionate encounter, use Step 3 After Party Restorative Gel to calm, soothe and hydrate your most intimate area. This product is the perfect after-party pick-up. CYCLOPENTASILOXANE, DIMETHICONOL, DIAMOND POWDER, CALENDULA OFFICINALIS EXTRACT, HELIANTHUS ANNUUS SEED OIL, PARFUM, TOCOPHERYL ACETATE, CI 77019, CI 77891, CI 77491, TOCOPHEROL, BENZYL ALCOHOL, LIMONENE. AQUA, GLYCERIN, HYDROXYETHYLCELLULOSE, AROMA, SODIUM BENZOATE, POTASSIUM SORBATE, SODIUM CITRATE, DISODIUM EDTA, CITRIC ACID, SODIUM SACCHARIN. AQUA, GLYCERIN, HYDROXYETHYLCELLULOSE, BENZYL ALCOHOL, ALOE BARBADENSIS LEAF JUICE POWDER, ROSA CANINA FRUIT OIL, CALENDULA OFFICINALIS FLOWER EXTRACT, PHENOXYETHANOL, POTASSIUM SORBATE, SODIUM CITRATE, DISODIUM EDTA, CITRIC ACID, MALTODEXTRIN, SODIUM BENZOATE, TOCOPHEROL.